Veterinarians make mistakes; they are after all human, and we all make mistakes. The big problem is this can mean life or death for your pet, so you really need to know what the common mistakes are, and what you can do to avoid them. It’s very difficult to know how often medical errors really happen with our pets. The Veterinary Record surveyed recent veterinary graduates, and of the 82 of 105 respondents (78 per cent) stated that they had made a mistake; this resulted in a less than optimal or potentially adverse outcomes for a patient. 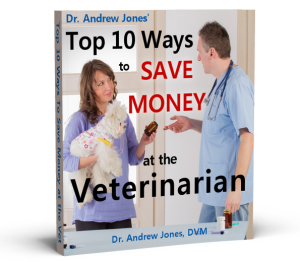 This article will go over the top 7 veterinary mistakes, and what you can do to avoid them. 1.Surgical errors. This can mean attempting to spay a male cat ( which I have once attempted), to much more serious errors such as leaving a sponge in the abdominal cavity, or performing surgery on the wrong leg. Unfortunately errors in surgery are much more common than most pet owners think, yet can be mostly prevented. Ensure that your veterinary clinic identifies your animal properly with a name tag. Show the surgeon or technician the exact lumps to be removed. Ask whether or not they use a checklist in surgery ( they should). Ask about the type of anesthesia and the monitoring- you want a technician to be monitoring your dog or cat while surgery is performed. Then again ask about recovery- will your pet be adequately monitored after surgery. 2.Misdiagnoses. As in your pet being diagnosed with the wrong disease, or your concerns not being taken seriously. This can go all over the board, from serious diseases not being diagnosed, such as a disease called Addison’s which is difficult to properly confirm, and many older practitioners may not be fully up on their continuing education. Then there is the other extreme in which too many diagnostic tests happen, and a ‘disease’ is diagnosed which may not be serious. I can think of a patient who was sent to an MRI on the back, and while this happened a ‘mass’ was seen in the liver. This caused a whole bout of serious concern for the client, and a biopsy of the ‘mass’ showed a ‘possible cancer’. This led to more invasive procedures, unfortunate complications, and in the end the pet had nothing more than hepatic nodular hyperplasia- a benign swelling. You need to ask many questions and be very involved. Ask whether or not the diagnostic test is needed. Ask for a referral if you think your older vet is missing something serious. 3.Medication Errors. Medication being mixed up, prescribed at the incorrect dose ( either too much or too little), happens frequently. In my own practice I saw that with some staff being not adequately trained, or not taking proper care to ensure that the medication written on the label actually matched the medication being dispensed. In one situation a client was to be sent home with an antibiotic for a skin infection, and ended up being sent home with a very potent immune suppressive drug. To avoid these you need to be asking many questions : What is the name of the drug? What is this drug for. How much of the medication should I give and how often? 4.Pre-surgical screening. This is in part related to surgery, but highlights a common error- lack of initial screening. Ensure that your pet is properly examined on the day of surgery, before any type of anesthesia is given. If there are any concerns about your pet’s health and anesthesia, then I would advise some type of blood test screening for organ function and the ability to metabolize the anesthetic properly. 5.Escaping Pets. Who would ever think that their pet could escape at a veterinary clinic? I would, for being in veterinary practice there were many times a dog or cat got away, running through the clinic. Most of the times they were quickly caught, but occasionally they made it out the front or back door. In this case you want to ensure that the veterinary practice takes your concerns seriously, and that they keep the back door shut when moving pets from the kennels to the surgery/treatment room. Clearly you can avoid problems by having a well trained dog, and tell the front staff that your cat is an ‘escaper’ so hang on tight and make sure all the doors are closed. 6.Injection Problems. As in injecting things in the wrong place, or injecting things that shouldn’t be injected. The classic is having a intranasal kennel cough vaccine drawn up into a syringe, then injected into the skin ( as opposed to being squirted into the nose). This happened at a veterinary practice I once worked at ( I didn’t give the injection), and the dog developed serious complications of liver failure. Other injection problems include not calculating the correct dose, and injecting too much of a drug- this easily happens with insulin, sending diabetics into shock. Once again you need to be clear on what your dog or cat is getting for medication, and before your veterinarian ( or lay staff) gives the ‘shot’ ask what it is for, and if that is the correct dose. 7.Supervision. Or more likely lack of supervision with new veterinary graduates, and new staff. The Veterinary Record survey of new graduates concluded that most of the medical errors happened due to lack of supervision. The new grads were hired, then left to fend for themselves. I myself had a similar experience in that after working for 2 weeks, my practice owner left me alone while he headed off on vacation. I recall spaying a large breed, overweight dog, having the uterine pedicles drop, and the abdominal cavity fill with blood. I struggled to find where the bleeding was coming from, and I thought that this dog could die. Fortunately I was able to locate the bleeding pedicle adjacent to the kidney, re-ligate it, and the dog recovered well. But this doesn’t always happen, and this could have been completely avoided if I had adequate supervision. Mistakes happen in veterinary practice- many more than you think as there are not statistics on veterinary errors. As a concerned pet owner, you can go a long way in preventing any of these from happening to your dog or cat by being involved. Ask questions about your veterinary practice and veterinarian. Do they use a surgical checklist? 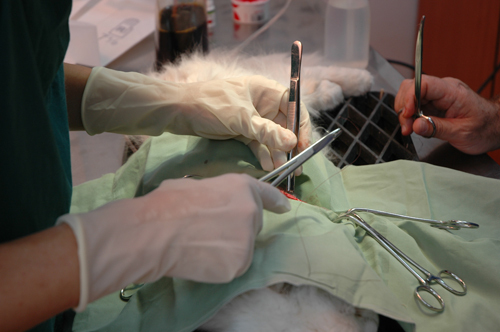 Is there adequate supervision of the animals during and after surgery. Ask about any medication being given to your pet-whether it is a tablet, or injection. 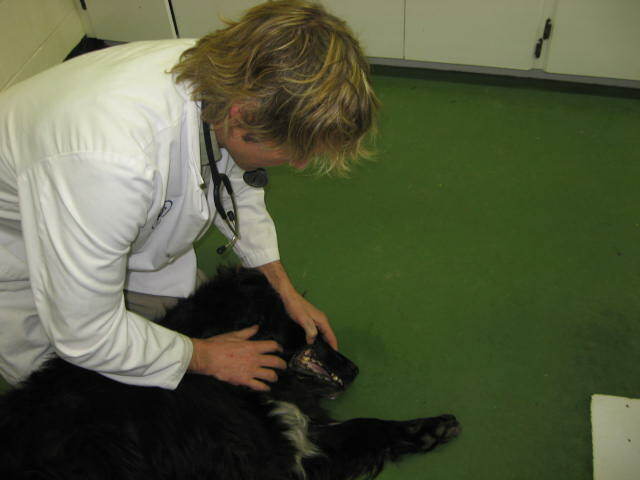 You can’t prevent all, but you can prevent most veterinary errors. I can relate to this article as my vet wrote a prescription and called it into Wal-Greens. I picked it up and looked at the bottle and saw it was supposedly the right medicine. Well, the spelling was off and it was the WRONG medicine. I never saw the written prescription so I had no idea of the correct spelling, it was off by 1 letter. 12 days later my cat was dead. I will never shop Wal-greens again for anything. My son had a pet mouse, it may have been only a mouse but we loved it. We took it to the vet as it had a skin irritation. The vet injected it, with a normal sized needle,into the back of its neck. By the time I got the mouse home it was unable to walk and soon became completely paralysed. It died a few hours later. I felt the injection had compromised the spinal cord, or even brain, but the vet refused to discuss it. My cat had severe pnuemonia so my vet drained her lungs. He also said she had a wound in her chest. Afterwards, she was released into our care. Something happened in the middle of the night. We found her lifeless between our beds. When I told the vet that morning he was surprised. She was not suppose to have jumped until the bed but she did not want to stay in her cage. I think the vet blamed me. I think he should have kept her overnight instead of sending her home to us. feed my dog their brand or their subsidiaries.. any comment?? Hello, many years back my dedicated neighbours worked extremely hard to create a Dog Haven here in West Australia. They always honour their (surprising) original commitment that NO dog in their care shall be euthanased. This is difficult to achieve and some of the time ‘difficult’ dogs are rehomed with staff, permanently. And yes, selection requirements upon prospective adopters of their saved animals are strict. However generally this is beneficial if not life-saving. Remember, all rescued dogs were in peril or were traumatised. I am one of those who regret having my cat’s life ended prematurely. My treating vet and I were in agreement that I’m Here Max could have his usual quality of life with the administration of pain medication for a month due to an inoperable cancer which had spread to his jaw. He was never a playful cat during his estimated thirteen years, nor much of a lap cat .He liked to warm himself by the heater and meowed only in the morning when he wanted his wet food. He used the cat litter without urging and his weight had stabilized when medication for hyperthyroidism was started. In short, other than being in the house most of the time rather than being mostly outside as before, and sleeping more due to the pain medication his life was much the same as before cancer of the jaw progressed. I didn’t find it a problem to wipe the occasional drool but he started to bleed on the left side of his gum line. I was concerned about this but had planned to take I’m Here Max to consult with a vet who also practiced holistic medicine for pets so I went ahead with the appointment and asked if anything could be done about his bleeding from his jaw by removing the three teeth which had become loose. The vet told me that he would lose his teeth on his own but that she wouldn’t remove his teeth but had good results with jaw removal. I had stated from the beginning that I didn’t want jaw removal, radiation or chemo so I’m not sure why the subject was brought up although IF I remember right she did state that this wasn’t an option at this point. The reason for my visit was to have herbal medication added to his current treatment was pushed aside and replaced by what I thought the vet was getting at was that, even with hospice as an option, a more effective pain killer, later on, the correct thing for me to do was to have him euthanized. To be honest, at the time I relied on what I perceived was the better judgment of the vet and a friend to euthanize him (ie: have him killed). That much as I would miss him and he required no more care really than a well cat I bought into the guilt trip that I was being selfish to keep him alive when he had a terminal cancer. That day I was initially relieved that I’m Here Max would be safe from any future suffering due to my “selfish desire” to keep him alive for an estimated 1 to 2 months more. It was less than two hours later that I realized that I had made a decision that was neither good for my cat, I’m Here Max, or for me. within a half hour drive with an indoor cat who NEVER meows so I feel confident he would let me know, if I missed other signs that the time had come. In addition I had him under the care of a vet who supported hospice as a good option for I’m Here Max and me. While others may not have the same support I had, I also had to contend with the ideas that “You’re being selfish to keep your cat alive in pain” and “You can’t tell when your cat is in pain”. In short the implication is that I are doing the wrong thing to let the cat live because the cat has a terminal illness and he was in pain which I didn’t realize. Don’t let this guilt trip influence what is best for your pet.